Self-Absorbed Boomer: Your correspondent embarks on a voyage and witnesses a rescue. Your correspondent embarks on a voyage and witnesses a rescue. 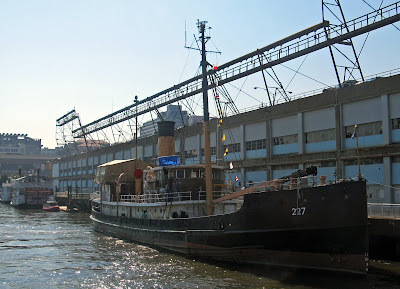 On Saturday I went to Pier 40 near the west end of Houston Street in Manhattan, there to board the former Lehigh Valley Railroad tug Cornell (see above) for a cruise around New York Harbor sponsored by the Twin Forks Chapter (Long Island) of the National Railway Historical Society. The purpose of this excursion was to view sites where railway traffic became waterborne. 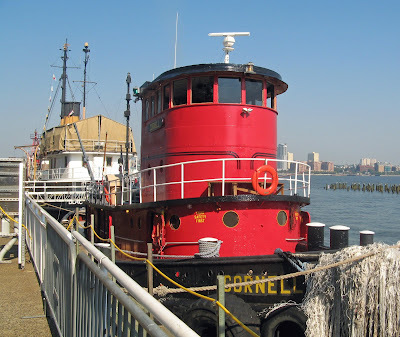 Cornell was one of the LV tugs, known as the "Four Aces" (the others were Cornell's sister Lehigh and the larger Hazelton and Wilkes-Barre), that picked up barges loaded with railway cars from LV's eastern terminus at Jersey City and brought them across the harbor to Manhattan, Brooklyn or Queens. There they would either be unloaded and their contents delivered to local consignees or transshipped onto freighters for export, or they would be sent on other railroads for shipment to destinations on Long Island or to the north. A similar service on a smaller scale, between New Jersey and Brooklyn only, is provided today by Cross Harbor Railroad. 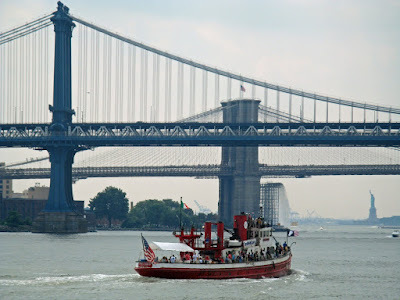 When I reached the gangway leading to Cornell's main deck, I saw a sign announcing that she had gone on an emergency mission, but would be back by 11:00 A.M. to pick up passengers for the cruise. Someone on deck beckoned me to come on board, and told me that Cornell had been called on to go up the Hudson about half a mile and try to pull John J. Harvey, a retired New York City fireboat that has been preserved and is also used for harbor cruises, from a mudbank on which she was stuck. 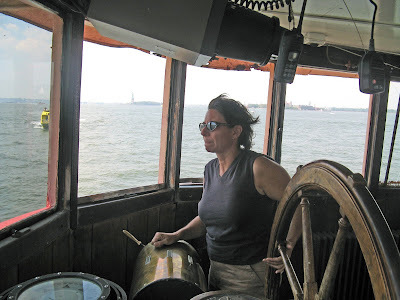 There were several other passengers already aboard Cornell, and we were all delighted by this opportunity to see her perform a true tugboat task. Not long after I boarded we left on our mission. 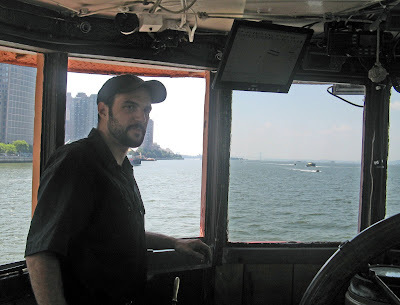 Here you see a Fire Department crewman (an FDNY fireboat is stationed at Pier 40) casting off the bow line to Paul, who served as a deckhand on Cornell for this voyage. After Cornell left her berth, we passed Lilac, a retired Coast Guard lightship tender that is undergoing extensive renovation. 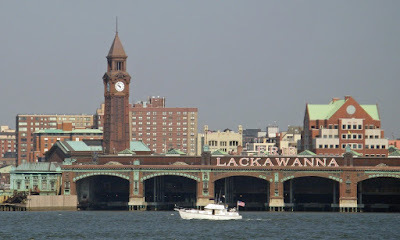 Going up the Hudson River, we passed the former Erie Lackawanna terminal in Hoboken, New Jersey. Here passengers would shuttle from commuter and intercity trains to ferries for the final leg of their journey to New York City. 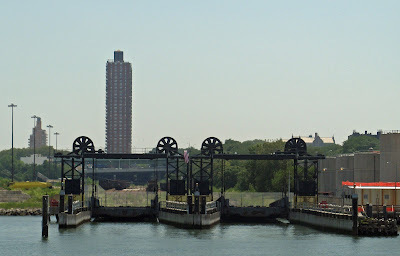 The need for ferries lessened with the completion of what is now the PATH (Port Authority Trans Hudson) subway in 1908, and the Holland and Lincoln auto tunnels in the 1920s and 30s. Now, however, ferry service is again becoming popular, and may become more so as people forsake commuting by car because of fuel prices. 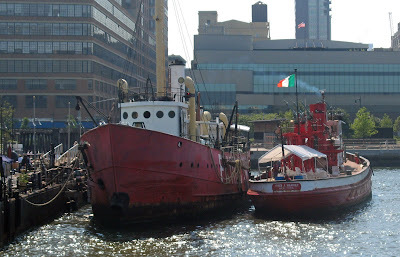 We found Harvey, flying the Irish flag from her mainmast, wedged into mud outboard of the retired, and under restoration, lightship Frying Pan (so called because she once warned mariners away from the Frying Pan Shoals near Cape Fear, North Carolina). Cornell had to be wedged into the space between Frying Pan's bow and Harvey's stern in order to make lines fast to Harvey. This task was made extra difficult by I-beams placed around Frying Pan to protect her hull. Nevertheless, we were able to get in and make fast in good time. Below is a video of Cornell making fast to Harvey, then of Harvey being pulled free. Once we had freed Harvey, people on the pier who were waiting to board her for a cruise loudly cheered Cornell. Could I resist waving back, even though I'd had nothing to do with the operation? Of course not. This is Matt, skipper and owner of Cornell. He was hospitable and helpful with questions about the vessel and tugboat operations generally. To top it off (literally and figuratively), he wore a Mets cap. 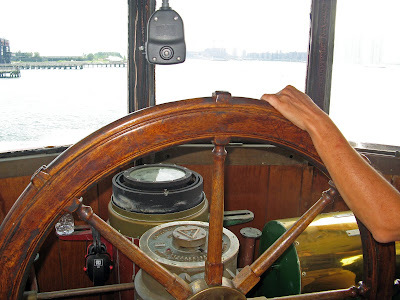 Ann, an experienced mariner, had the wheel and control of the engines throughout the voyage. She was sometimes "assisted" by her three year old daughter. After freeing Harvey, we went south past the Battery and into Buttermilk Channel, between Brooklyn and Governor's Island. 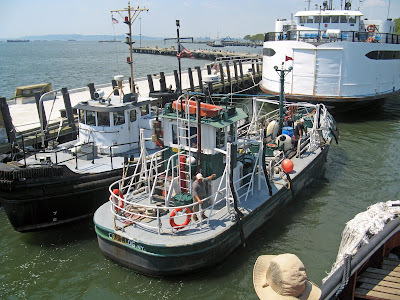 We pulled into a slip on the Governor's Island side, next to the small harbor tanker Capt. Log, from which Cornell took on fuel. The large white hulled vessel beyond Capt. 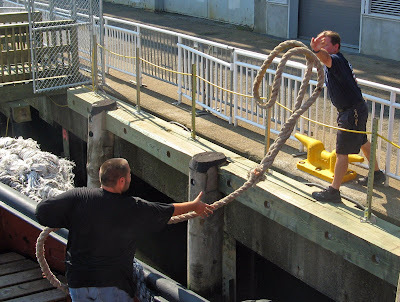 Log is Islander, which used to ferry passengers and cars from Woods Hole, Massachusetts, to Martha's Vineyard. While we were refueling, a group of kayakers paddled by. 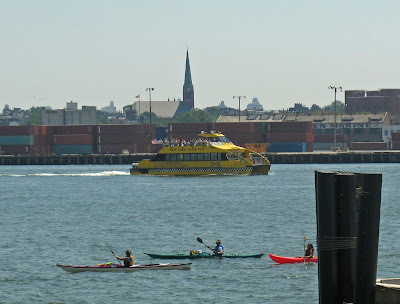 The yellow vessel in the background is a New York Water Taxi, part of one of the ferry services that have started up in the past few years. 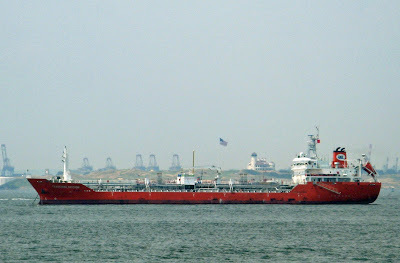 Near the southern end of our voyage, we passed the small tanker Tradewind Passion, anchored just inside the Narrows separating Brooklyn from Staten Island. In the background is the port of Bayonne, New Jersey. These are docks for car floats; that is, barges carrying railroad cars. The tracks on the decks of the floats connect to tracks on land, so that the cars can be coupled to locomotives and pulled off the floats. These docks, in Bay Ridge, Brooklyn, have recently been restored to working condition but have not yet been put into operation, as the fencing attests. Car float traffic to Brooklyn now goes to docks further north, in the Bush Terminal. 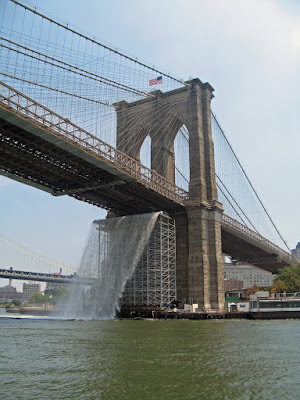 Danish-Icelandic artist Olafur Eliasson designed four large artificial waterfalls that are in operation this summer: one at the northern tip of Governor's Island, one just below the Brooklyn Heights Promenade, one below the eastern tower of the Brooklyn Bridge (shown in the photo as seen from Cornell going north on the East River), and one on the Manhattan side between the Brooklyn and Manhattan Bridges. 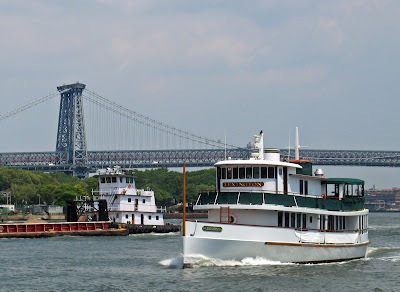 Between the Manhattan and Williamsburgh (seen in the background) Bridges, we passed the classically proportioned yacht or excursion vessel Lexington, as she was overtaking Glen Cove pushing a loaded barge. Ann's steady hand is on the wheel. As we approached the site of the former Brooklyn Navy Yard, we saw the beneficiary of our earlier rescue, Harvey, come out into the River ahead of us. 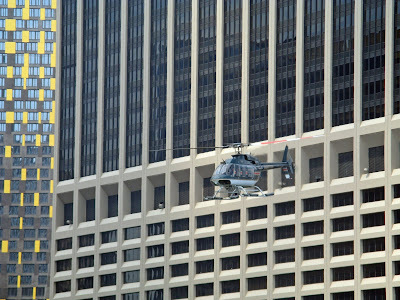 While we were passing the Downtown Heliport, a chopper soared up in front of the massive 55 Water Street office building. 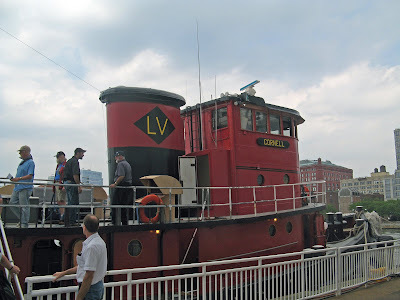 Here is Cornell back at her berth, displaying the Lehigh Valley's "black diamond" (carriage of coal was the road's principal revenue source) logo on her funnel. Update: Cornell now has her own website. nice post. i saw you guys touring the harbor. Fresh Air Fund - last chance!